Supporters often say that coal produces cheap energy. But things are not quite as simple as the industry suggests.The real cost depends on what is included in the reckoning, and who pays for that. The price of power reflects the costs incurred by the energy producer, along with taxes and levies. However, some factors are not included in the price and never show up on an electricity bill. These are the so-called external costs. These externalities occur when a market actor (in this case, the coal company) affects the welfare of others but does not compensate them. In other words, the person or organization that causes a problem does not pay fully for its consequences. It pulls in a profit but passes part of the costs on to third parties, or to society at large. Mining and burning coal involve enormous external costs. The most significant costs are government subsidies, environmental damage and harm to human health. Taking this into account, coal becomes an expensive commodity. The International Monetary Fund has revealed that post-tax subsidies for coal amounted to 3.0 percent of global GDP in 2011, rising to 3.9 percent in 2015. This is largely due to the high environmental costs associated with coal consumption. Those costs include greenhouse gas emissions and air pollution. It is impossible to put hard numbers on these; instead, we have to rely on estimates and judgement. Some types of damage cannot be reversed. In addition, costs are not based on the intrinsic value of ecosystems harmed by climate change, for example, but on the economic losses. The costs of repairing damage after a major accident are included, but only to a limited extent, to avoid forcing the business concerned into bankruptcy if damages are claimed. These considerations mean that any figures – such as those provided by the British consulting firm Trucost to the United Nations Environment Programme – are politically tinged. The numbers should be treated with caution, but they are huge, even if they are just the tip of the iceberg. According to Trucost, the external costs of using coal to generate power in 2009 amounted to $452 billion in East Asia alone. These costs were mainly attributed to greenhouse gas emissions and air pollution. In the same year, the costs in North America reached $316 billion. In Germany, air pollution and greenhouse gases added up to more than 28 billion euros – exceeding what was spent to support renewable energy. 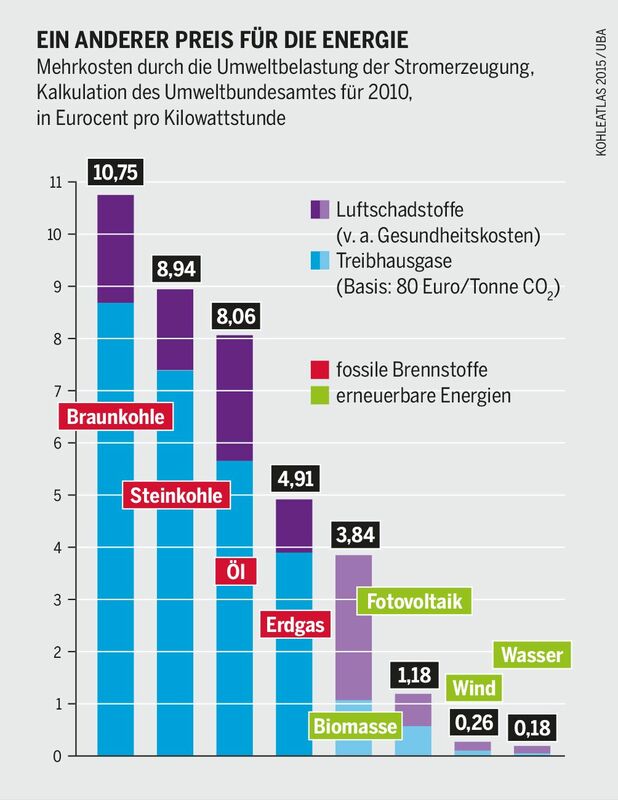 For lignite, the German Federal Environment Agency puts the environmental costs at around 11 euro cents per kilowatt-hour; for hard coal, the figure is 9 cents. If these costs were reflected in the energy price, electricity bills would rise. In the USA, researchers estimate that a coal-fired kilowatt-hour would have to cost between 9 and 27 US cents more than the customary 10 cents appearing on the electricity bill. If the coal companies were to internalize these external costs, coal would barely be competitive and would be displaced from the market as a result. A more realistic price would not automatically compensate people harmed by climate change or those suffering from air pollution. The coal companies should have to take on the legal as well as the financial responsibility. A public admission of guilt and an apology to the victims would be appropriate. Both are taboo for the industry. The apparent cheapness of coal is also a result of subsidies from the taxpayer, both current and in the past. Energy producers are still profiting from the support they received in the past. In 2014, the German consulting firm Ecofys put together some impressive numbers for the European Commission. Between 1990 and 2007, the current 28 members of the European Union subsidized the expansion of coal-related infrastructure to the tune of 200 billion euros. 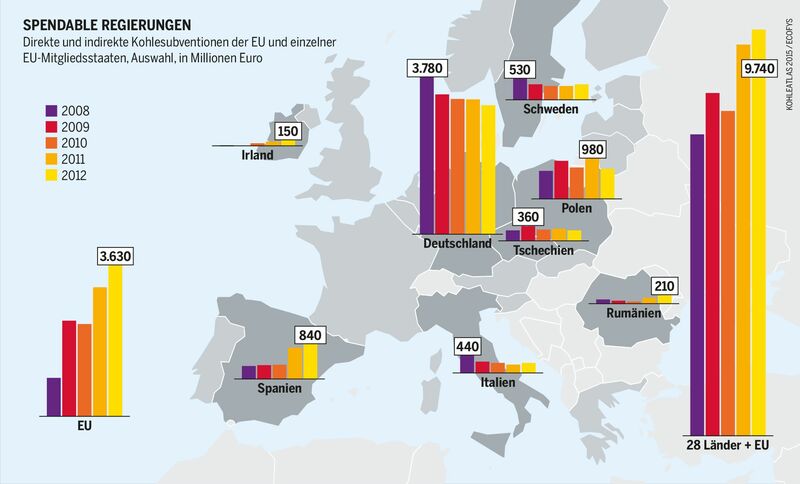 Only nuclear power got more support, with 220 billion euros. 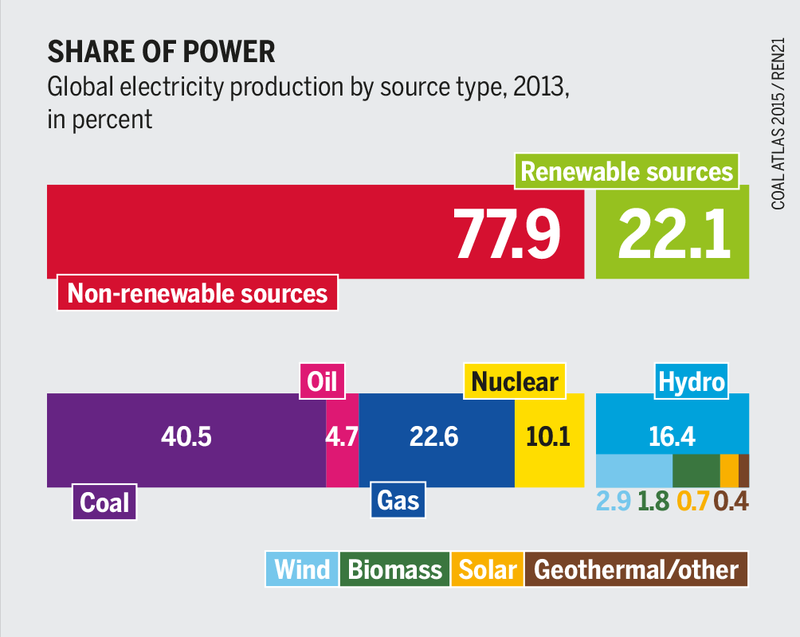 Aside from 100 billion euros spent on hydropower, renewables were not directly subsidized. Government support has ensured that locally produced coal stays competitive. Between 1970 and 2007 this support cost the EU countries a total of 380 billion euros. Germany leads in the subsidy race. One source of funding is the 1.2 billion euros that the German government contributes directly to the hard-coal mining industry. Between 1974 and 2007, the EU governments as a whole spent around 87 billion euros on fuel research and development. 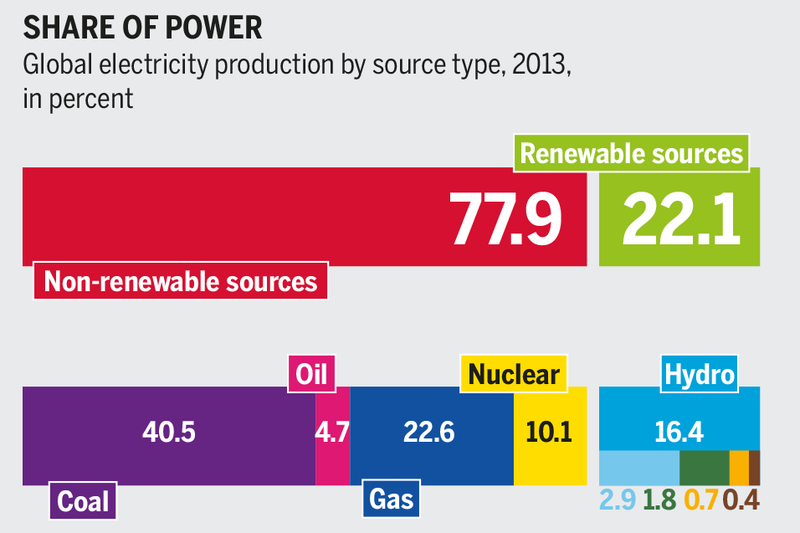 Nuclear power got the biggest chunk, at 78 percent. Another 12 percent went to renewables, and 10 percent to fossil fuels – with coal getting more than oil and gas. In 2012, the member states of the EU handed out a total of 13.4 billion euros to the fossil-fuel industry. Outside the EU, coal subsidies are huge, too. A study by the Global Subsidies Initiative found that in Turkey, for example, they amounted to $730 million. The OECD puts the figure for Australia at over $125 million in 2011. In 2009, the governments of the G20 group of major economies committed themselves to phase out subsidies for fossil fuels in the medium term. The worldwide shift to renewable energy will gather pace if they put their promises into action. The European Union’s climate policy aims for lower emissions, lower consumption and an increase in renewable energy. The targets are achievable – but they ought to be more ambitious. there is no information about coal of Pakistan....! currently in Sindh Engro Coal Mine Company in Tharparkar Sindh started open pit mining.